This is the perfect dish for summertime BBQs. As soon as I saw this I was intrigued. It reminds me of an American twist on a middle eastern salad called Fatoush. For this, I would go with a Napa Valley Sauvignon Blanc. More herbs than a New Zealand or Chilean version. Prepare your grill to medium heat. Brush all of the vegetables with the olive oil and season them with salt and pepper. Grill the vegetables until they are just slightly charred. About 3-4 minutes per side for the peppers and onions, 1-2 minutes for the scallions and 2-3 minutes for the zucchini. 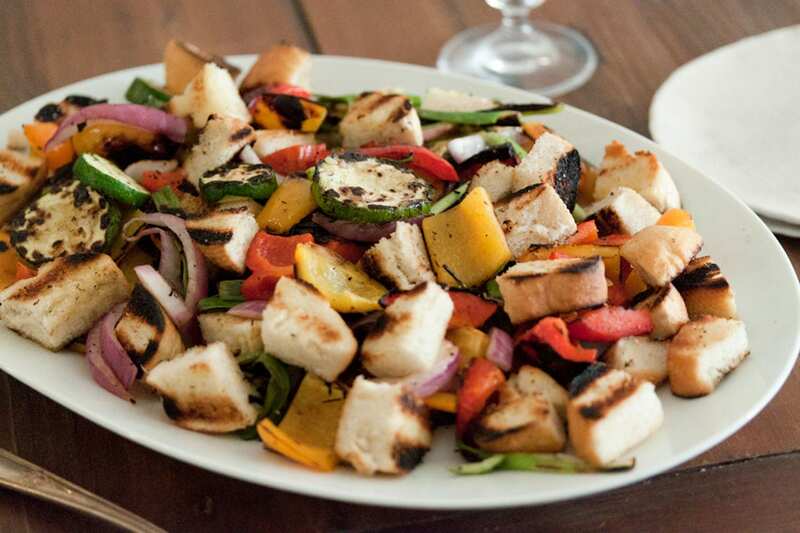 Remove the vegetables from the grill and set them aside. Once the vegetables are cooled, cut them into 1 inch pieces. Brush the baguette with the melted butter and season it with salt and pepper. Place the bread cubes on the grill and let them grill for 1-2 minutes per side until they are nice and golden brown with grill marks. Remove the bread from the grill and set it aside. In a small bowl, whisk together the ingredients for the vinaigrette and set aside. When you’re ready to serve the salad. Toss all the vegetables and bread together in a large bowl. Drizzle with some of the vinaigrette and taste. Add more vinaigrette if needed. Serve immediately.